A uniquely inspiring and results-driven fitness experience in a friendly, fun atmosphere can be yours! 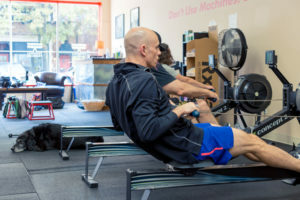 Lose the mundane static cardio and standard weight training routine and have the best personal training experience of your life at Gateway CrossFit Personal Training in Clayton, Missouri. Our commitment to you is to provide a safe, effective CrossFit training experience steeped in excellence with obvious and exciting rewards. You will see results far beyond what you have previously experienced in any other fitness regimen. Many years ago, CrossFit, Inc. founder Greg Glassman wrote a letter titled Fundamentals, Virtuosity, and Mastery. Virtuosity is a word used in gymnastics that means “performing the common uncommonly well.” Coach Glassman wrote, “Virtuosity is elusive, supremely elusive. It is, however, readily recognized by the audience as well as coach and athlete…physical training is no different.” Our philosophy is virtuosity; perform the “common” uncommonly well through fundamentals of mechanics, then consistency, then intensity. We promise you–remarkable results will follow. Gateway CrossFit lives by that motto and believes nothing is more gratifying than changing our clients’ lives in an enormously positive way. We are here to help you! And, frankly, the more out of shape you are, the more excited we are to work with you! We have tremendous fun working with beginners and those returning to the scene after injury. The results in our clients’ quality of life provide us with the ultimate motivation. At Gateway, we firmly believe fitness and nutrition go hand-in-hand for optimal wellness. We offer guidance on nutrition for best health and weight loss results. We can make nutritional recommendations to help you reach your goals faster with AdvoCare products: innovative nutritional, weight loss and sports performance products that we believe are some of the best on the market. Physical fitness and health have been a lifestyle for both of us; we want to share our knowledge and passion with you. We can guide you, motivate you, and change your life by having total wellness become your way of life, too–for life! Contact us with questions or schedule your complimentary first visit and get started on the road to complete wellness today! 314-726-4702.. We can’t wait to meet you!